As several of you pointed out after I posted my כתב ע"ג כתב question last week, my writing is written in a "tweaked" Beis Yosef. I want to take a בחינה from the Vaad to receive a קבלה, but I am nervous that they might be wary of giving a קבלה with such an "interesting" כתב even if they hold that it is 100% kosher. Is this a valid concern? 1. No flat מושב on the למ"ד. 2. No head on the רגל of the קו"ף. 3. Pey Lafuf in פן. I was going to write a special, more standard מזוזה to present to the Vaad, but that seems very disingenuous. Avi, one thing I learned in my 15 years in Stam - You need to be a conformist. Those who do their own thing, even if they have solid argument for their shittos, usually have trouble selling their work and don't get very far. Today's standards are fairly rigid. There are very few places left in the world where sofrim can still do "their own thing" and remain accepted. you can ask rabbi a.t. wosner if he would give you kabala, but like r' eli said you will have a hard time selling that. Every area of halacha has gone through a complex process of development from Har Sinai through the periods of the Talmud, Geonim, Rishonim, Acharonim until today. STa"M is no different. There are lots of sefarim being published by people either being medayek or mechadesh a new understanding in the Gemara/Geonim/Rishonim and as a result changing some part of our accepted halacha or minhag. Many of these sefarim have good haskamot (which, as a side point, most often do not attest to the veracity of the sefer ledina but rather either to the person's character or the lomdus of the sefer). Again, STa"M is no different. As a nation we have accepted the works of certain gedolei hadorot as being the most influential in determining our psak halacha today. These include the Rambam, Shulchan Aruch and Rama as well as the various acharonim that have commented on these works lema'aseh - particularly today for Ashkenazim the MB, but there are many others. Whether you agree with "codifying" halacha or not (both, I think, are valid views) the reality is that Am Yisrael has accepted these works as binding. There is obviously much to be said, as well, for long standing minhagim, especially in STa"M, and there is also what to be said for a reknown posek hador being mechadesh aspects of halacha for various reasons. R' Eli really made a good point from a practical point of view. Along the lines of what R Eli has said, I think that sometimes it also makes an important halachic point. You need to have solid shoulders to be noheg in a way that essentially clashes with minhag yisrael. That's not to say that your nuances are unfounded or wrong in any way. But minhag yisrael has real halachic significance and kedusha. The Tzurot HaOtiyot as we are noheg today do have differences - B"Y, AR"I, Vellish, Alter Rebbe - and even within those there are varying minhagim. Accepted minhagim are fine and good and are what I think brings out kedusha in yiddishkeit - Lo BaShamayim Hi. But in order to take the lomdus of a sefer and use it lema'ase, especially in STa"M, I think requires a lot of confidence or the acceptance and support of accepted poskim. Even if the halacha appears correct. And even if you have found STa"M from years ago written in particular ways - if we are not noheg that way nowadays I think it's not an easy thing to change (on your own). Your basic line of reasoning is very sensible. However, the question at hand is not whether we should completely replace the prevalent minhag in favor of a corrected Beis Yosef Ksav. If a learned individual has a well-reasoned shitah in Halacha he has a right to follow it, and certainly if there is no downside to doing so according to normative Psak. This Ksav is not for the unsuspecting masses; rather, it is for the Sofer's personal use or for those who rely on his halachic judgment. I think that Reb Avi is aware of any difficulties he might have selling his Ksav. He was only asking if the Vaad will have any issue giving him a Kabbalah based on it--not for halakhic reasons but for any "hashkafic" issues about being a "nonconformist Sofer." In that case - I'm not sure that it's disingenuous at all. The reason they get you to write for them is to show that you're capable of writing properly, which if you write "normal" b"y is exactly what you'll be doing. The halacha exam is for the halacha. I wouldn't think there's any obligation to write anything other than what they expect you to. If you decide to write your special ktav in order to show them for whatever reason then I guess you should be prepared for whatever answer they give...but otherwise I don't see reason to worry. Behatzlacha. R' Eli is giving you some very sage advice here. I would add that you have to remember, when writing sta"m, that other people are relying on you to make sure that they are yotzei mitzvos. You have to write for them, not for yourself. That being the case, it is very important to use universally accepted shittos whether writing sefardi, ashkenazi, or Chabad. When writing for your own use, if you feel that you have the shoulders to decide such things, then you can write however you want. However, you must use the most pareve, normative shittos when writing for others. I know an ashkenaz sofer who decided that he would write only according to Temani custom and the Rambam's shittos because he was under the misguided impression that it was somehow more authentic than other mesorahs (a lot of people make this mistake). He received kabbalo, but had non-stop headaches from customers, rabbonim, and other soferim. He was viewed as a daas yochid by his community, couldn't sell anything, yet refused to write anyway else. Today he is an insurance appraiser. The difference here is that this is simply going back to a Ksav more in line with the standard Rishonim who are the עמודי ההוראה of Ashkenazi STaM. As far as I know there is not a single serious scholar who doubts this fact, even if lemayseh today he feels we should stick with the widespread style of writing. There is no halakhic issue with the older tzuros even according to the most "pareve, normative shittos." Especially on a small scale, the older-style Ksav is unlikely to provoke "non-stop headaches from customers, rabbonim, and other soferim." Going back to "older styles," in any area of Halacha, such that it constitutes a break with normative practice, is not a simple matter. This is even more true in matters such as safrus and shechita, in which a kehilla must be somaych on an individual. "this is simply going back to a Ksav more in line with the standard Rishonim"
I also think that this statement is not fully accurate. The issue here is not going back to the shitot rishonim in a case where we currently are not practicing acc to the rishonim. The issue is changing established minhag on the basis of another interpretation of the rishonim found in the lomdus of a Sefer. Current minhag is not based on our rudimentary reading of rishonim and just that now we are being told we were mistaken. Current minhag is based on gedolei haacharonim. 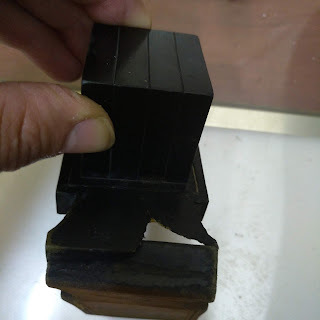 Did the chafetz chayim's tefillin have a straight diagonal regel lamed? I should note that at the end of the lamed section in temunat haotiyot from what I can recall he still writes to make the moshav flat. I do agree, though, that if a Sofer wants to write a certain way for personal use then its a different story. Nowadays we are in a better position to assess what the Rishonim actually meant when they told us how to write. Access to STaM that was actually written in their times compared with careful and honest analysis of their works has allowed us to weed out changes that have crept into Ashkenazi Ksav over time, either through natural stylistic change or "diyyukim" in the Rishonim which we now know to be questionable. The Ksav under discussion in this post is not just another chiddush based on "lomdus of a sefer." Therefore, I do think it is accurate to state that "The issue here is ... going back to the shitot rishonim in a case where we currently are not practicing acc to the rishonim." 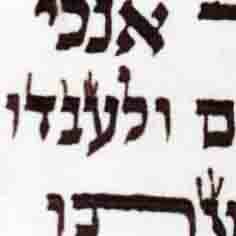 However, this is not to say that it is not a legitimate approach to write according to contemporary Ksav anyway--as long as one's reasoning is that there is no need to reconstruct the Ksav as the Rishonim meant it in every detail because handwriting has always changed slightly in different generations and places. The goal of Sefer Temunas Ha'Osios is to correct what he views as the major corruptions of contemporary Ksav, without changing the basic style too much. This was in the hope that he wouldn't ruffle too many feathers and Sofrim would more readily accept his changes. His conclusions do NOT reflect what he believes to be the actual intent of the Rishonim. There are two separate points here. (1) Assessing the original intent of the rishonim. (2) How to be noheg lechatchilah today. On the first point - it exceedingly difficult to say that "such and such" is 100% what the rishonim meant and everything else is a corruption. In doing so you are saying that every other gadol hador and posek misunderstood the rishonim and that "changes that crept into ksav" also crept into the psak and understanding of the gedolei haposkim. It therefore follows that you cannot say that we are definitively "not practising acc to the rishonim". What you can do is present an alternative approach to the rishonim and suggest that this is what they meant. Without explicit, conclusive proof or the concurrence today's experts in STa"M - what this is is precisely lomdus. That's not to say it's wrong. But it's certainly not to say that it's the only interpretation. "Access to STaM that was actually written in their times" - does Sefer Temunat haOtiyot bring any proofs from items found from the times of the rishonim? Do we have such STa"M that proves how we should write the lamed? Or was that just a general statement about how much wiser we are? On point (2) - the fact that the very sefer on which you base your special ktav and chiddushim says that even though this is the chakira, lema'aseh lamedim should be written with a moshav pleads the biggest case that we cannot just change the way we write. Obviously he believes in his interpretation of some of the rishonim, which I agree are not reflected in his conclusions. But I don't think he'd write a psak lema'aseh as a conclusion if he thought we should write according to his chakirah. And if he doesn't think so, why do you? Do you have any real poskim or tangible evidence of rishinom-era writing that would support actually writing this way lema'aseh? Because if not, even though people paskening their own way these days is becoming quite popular, I find it a very hard thing to do, especially when it means breaking with minhag yisrael. Sure, there is plenty of STaM from the times of the Rishonim found in libraries and museums around the world! 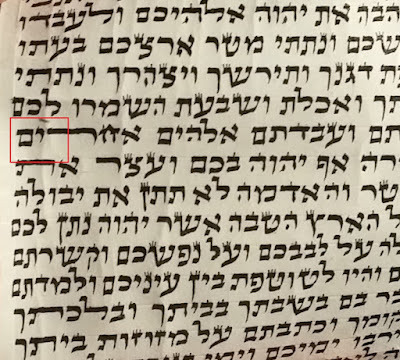 Bits and pieces of it have been published in some Seforim (including מסורת האותיות, פתשגן הכתב, and a Sefer defending the Sefardi Ksav whose name escapes me). Some major Talmidei Chachomim have also shown me their personal collections of scans. Regarding the lamed for example, to the best of my knowledge there is no example of a lamed with a flat base from before about 500 years ago. I guess I wasn't clear that the author of Sefer Temunas Ha'Osios does not really think that his compromise is the correct way to write. What he presents in his Sefer is just that, a compromise that he feels has a better chance of being accepted. See also its sequel Sefer, Mesores Ha'Osios as well as Sefer Patshegen Ha-Kesav. There are a number of beliefs about halacha and current hanhagos that are very dangerous today: "correcting" the Acharonim, changing contemporary practice based on Archaeological evidence, resurrecting extinct nusachos of tefillah, attempting to re institute the sanhedrin, etc. These things seriously undermine true Torah hashkofa. What we have for Yiddishkeit today is the product of mesora - an ever evolving practice based on the collective contributions of Klal Yisroel and its Gedolei Torah. The way we practice Yiddishkeit is not an accident - it is the ratzon HaShem. That is the strength and authority of mesorah. Assessing the original intent of the rishonim is interesting as an academic pastime, but it has no bearing on current halachic practice. I do not give kabbalo in Sta"M- that is best left to the Vaad and other certifying organizations. However, I do give kabbala in other areas. I would NEVER give kabbala to anyone who would be cholek on the hanhagos of rov klal yisroel. If someone told me that they only wanted to check their chalaf with their tongue, and not use their fingernail, or said that they only wanted to hold by the Rambam's shittot and not that of later poskim (which I hear a lot! ), I wouldn't give them kabbolo - furthermore, I would treat their shechita as treif! Everything is a balance. Of course Mesorah is very important but on the other hand there is always מקום להתגדר for later generations. One finds many different approaches to this very complex issue. Branding your exact perspective on the matter as the "true Torah hashkofa" is unhelpful. And as for someone who decides to follow the Rambam on everything--I agree that this approach is very misguided (except perhaps for Teimanim), but to say that his shchitah is treif--wow. In Shechita, because the kehilla is having to be somaych on the maaseh of a yochid, the yochid has to schecht according to the standards of rov kehilla. A yochid who wants to pasken le daas atzmo, which is what we are discussing, and not like the mesoras hamekubal, is imposing his own shitos on the rabbim. We cannot trust the shechita of such a person because we do not know what standards to expect from him. We do not know what he will do when a problem will arise. His shechita must be regarded as treif because we do not have a sense of upon what he relies. The whole idea of kabbala in safrus, shechita, etc. Is that we know what to expect of the person lechatchila and we know that he can be relied upon to take appropriate remedy when a problem arises. Someone who "bucks the trend" cannot be relied upon by the kehilla. Writing or shechting for themselves is certainly not a problem - but no one else can be somaych on him. This is an issue that I am extremely passionate about and for which I have waged many battles - only the greatest of the gedolei and poskei ha-dor have the right to advise deviations from or alterations to the standard practice and mesora as it exists today. Returning to older practices or "correcting the Acharonim," is something that no one has a right to do without having consulted the gedolim. Otherwise, one is opening to door to tremendous mikhshol and will have to give a din ve-cheshbon for doing so after 120! "(And by the way, whether you agree with it or not, the general trend among poskim, particularly in Eretz Yisroel, is to be choshesh for plenty of shittos in rishonim that klal yisroel had until that point not accepted.)" This is exactly the point that I think keep getting side-stepped. As R Bloomenstiel noted "only the greatest of the gedolei and poskei ha-dor have the right to advise deviations from or alterations to the standard practice and mesora as it exists today". Irrespective of what each of us consider to be "true Torah hashkofa", "al pi haTorah asher yorucha" applies to all of us, I would think. The poskim go through many considerations before issuing psak or even being maskim to a certain practice. Sometimes they say things to do just what you said "be choshesh" for certain shitot, for whatever reason. Sometimes they also pasken like rishonim in sh'at hadchak or cases of hefsed meruba, even when such has not been the minhag. Sometimes they feel it is the right thing to change back to a more 'authentic' intention of the earlier halacha. This is the authority they have as our gedolim. What if other sofrim decided to follow a certain interpretation of the rishonim and make other changes based on their inspection of earlier works? Where would we be if each person could decide when to stay with minhag yisrael and when to "change"/"return" etc to something else?Like I said - if you got haskamot from accepted poskim to support your intent to write a certain way I don't think there would be such an issue. To be intentionally noheg against minhag yisrael, in my opinion, goes against this. It is saying that you have as much a right as the gedolim to change what we do. If you have hasmacha to give psak or you feel that you are on this level then perhaps that's a different issue.